OK, so, what would you say, my ‘foodie’ friends, if you found out that your favorite ‘slow food’, ‘sustainable’ and ‘local’ touting restaurant exploits and abuses its servers and busers….most who are ‘conveniently’ non-white racialized people? Weird that the further you go back into the kitchen the ‘darker’ and more ‘abused’ a worker is. Seems like many ‘foodies’ and ‘slow food’ restaurants are only concerned about the ‘purity’ of their meal ingredients, but don’t care much about the lack of ‘purity’ behind racialized and gendered abuse and exploitation. 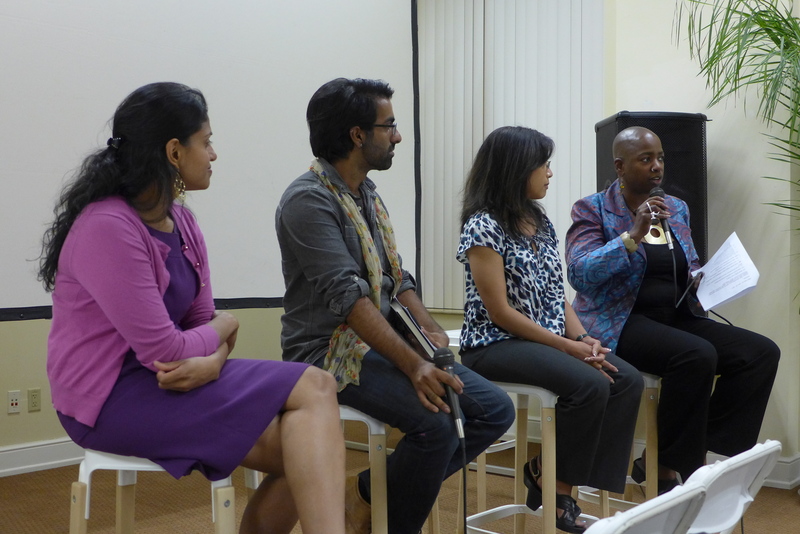 On May 6, 2013, Oakland HUB hosted an amazing dialogue about human abuse and exploitation in the restaurant business of the USA. Saru Jayaraman presented the research from her latest book Behind the Kitchen Door, which explores the numerous human rights injustices that restaurant workers endure. Jayaraman talks about the heightened abuse of racialized minorities and immigrants as restaurant workers. What I found particularly amazing was Saru’s focus on “sustainable” and “slow food” restaurants that tout how ‘ethically’ sourced their foods are, yet many treat their workers unethically. Basically, a significant number of the ‘higher up’ employees and the mostly white and middle to upper class patrons only care about the ‘purity’ of ingredients of their foods; they do not care about how ‘sustainable’ or ‘ethical’ it is to make someone work without sick days, work while they have H1N1 (because taking time off means they lose their jobs), or that over 40 states have made the minimum wage for servers about $2.13/hr. Saru speaks of the plethora of servers and cooks who were infected with Hepatitis, H1N1, and other illnesses, and how they ended up exposing thousands of other people to these diseases. She talked about a bartender in DC who was unable to take time off, although he knew he was sick. However, one day he simply could not get out of bed and had never gone to the doctor because he didn’t have health insurance. After being immobile and in bed for a long time, he basically crawled to Korea town and hoped that someone would take mercy on him to diagnose what he had. He was told he had H1N1. It took him weeks to recover, and when he finally returned to work, they said his job had been given to someone else. Furthermore, the bartender had incurred over 10k dollars of credit card debt, while sick and trying to recover. After Saru spoke, there was a panel of food justice workers, moderated by Ashara Ekundayo, to talk about what it means to be a “foodie of color,” decolonizing the diet, and trying to get the ‘privileged’ to care about the 10 million restaurant workers who make their ‘special’ cuisine possible. This video below is about the food justice panel discussion after Saru spoke. On the panel are Jayaraman, Saqib Keval, Ashara Ekundayo, and Nikki Fortunato Bass. Also, pay special attention to how brilliant and acutely aware Ashara is about her own geo-political status as a woman of African descent with the ‘privilege’ of formal education, a USA national citizenship, and English as her first language. She, and the other panelists, complicate the notion of ‘food’ by asking what it means to be a foodie of color– both in the USA, and traveling outside of it. People’s Kitchen founder Saqib Keval and Ashara talk about how, while they were in France, their brown and black racial identity wouldn’t allow them entry into certain restaurants… but then Ashara notes when she opened her mouth and her USA English accent came through, that would often give her a ‘pass’ to enter. Similarly to my dissertation work about how much so many USA vegans don’t really care or understand that their ‘cruelty-free’ vegan commodities are made possible through racialized and gendered exploitation(this link connects people to the PDF of my dissertation), Jayaraman and the panelists engage in deep dialogue about the implications of such a ‘privileged’ and a ‘narrow’ mindset on how one engages in what they think is ‘ethical’, ‘sustainable’ and ‘good food.’ Even though I know Saru published the book to educate people about the abuses occurring in the restaurant business, I felt quite frustrated at the end of the discussion; not because of Saru’s work, as I think she is awesome and a great mentor. What I found frustrating is the notion that if you ‘educate’ people who are causing abuse and exploitation, that that ‘new’ education will mean they will stop committing these injustices against people. I feel like education does not necessarily mean people will care. This is probably from my own work and observing a significant number of vegans of the USA, not care to change their consumer behavior, after learning that a vegan commodity they purchase was made possible through human slavery, structural racism, and coloniality. For them, they are ‘ethical’ enough, simply because a non-human animal was not exploited or killed for their vegan goodie. All the education in the world about the human abuses that make their vegan stuff available, doesn’t seem to work. But, Jayaraman stated that what makes ‘the privileged’ owners and shareholders of restaurants ‘care’, is when one presents to them that if they treat their employees unethically, they will end up losing money in the long run. She cites the example of how Olive Garden was sued because an employee with Hepatitis A (who didn’t know she had it because she couldn’t get insurance or go to a doctor) exposed thousands of people to her disease. It was a financial disaster for Olive Garden to be sued; hence, if you present to them that they will lose “their” money for not “caring” about their employees, then they get interested. It is sad and disgusting that that is what it takes for SOME owners and stakeholders to care. Disgusting, and disappointing… but not surprising. Talk about it! Jeeze! Everyone asks me about organic but no one thinks about how workers are treated on organic farms – they can be just as industrial (mono-crops and worker abuse included) as conventional farms. I am happy that Unite Here a national union is taking on this issue at one of the top food service providers – Bon appetite. Bon appetite talks a lot about their cage free eggs while their kitchens are full of racism and sexism. A caged worker serving cage free eggs. Do you care more about the tomato or the hands that picked, washed and sliced it for you? Very, very true, Hanna! That is why I tell people we need to shop at farmer’s markets and support our grower because they work incredibly hard to bring food to out table. I also have a plant-based nutrition for MANY reasons and a major one is because I will not support the unethical and unjust treatment slaughter house employees experience. Most of these employees are undocumented Latino workers who are poor. I have a plant based nutrition– 6 out of 7 nights of the week of the week my husband and I eat at home and when we go out we only go to healthy “vegan” restaurants who claim are “ethical”, respect animals, the environmental and people (and I assume their employees as well!). Wow, this raised a question in my conscience about which restaurants we chose to eat in. Thanks to this blog post I will definitely question “ethical” restaurants from now on! I will also be sure to be vocal about this and place a comment/question in their little box. Wow, this was definitely a gem of info!!! I’ve got to research these speakers more because I’m very fascinated by this movement. I’ll admit my greatest frustration with dining out has everything to do with what is considered “delicious” verses “nourishing” and how emotional eating tends to be and how that is very normalized. Although I’m in an area with many vegan dining options, the quality of the plate of food can be as nourishing as a big mac with cheese. And it seems in those establishments, the focus is simply on providing plant-based foods with little regard for much else. I imagine that is also true with their staffing approaches–and having spent time working in food service I’ve had first-hand experience with the front verses back of the house color divide. Further evidence that the US healthcare system is wrong. People are punished just for being ill or injured by getting saddled with enormous debts. Although that is, of course, only part of the picture. It was a good night, thanks for capturing it here. I especially loved how the question of being a foodie of colored was framed; it’s definitely a nuanced question to delve into. A quick add – Van Nguyen gave a great plug as ROC’s coordinator, but the woman on the panel next to Ashara is Nikki Fortunato Bas (EBASE). Thanks!!! I will change to the right name, Aileen!